It has been cold this winter! My bones are cold, my feet are cold, my hands are cold… but my stomach is nice and toasty! Why? 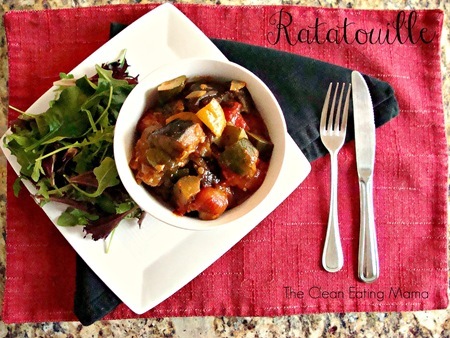 Because I have heaps and heaps of hot Ratatouille in my belly!!! Big chunks of veggies, tomato broth and an amazing array of herbs makes this dish one of those meals that is great for lunch or dinner, alone of with a crowd. Want to come over and have some? Preheat oven to 350 degrees. Place the entire can of tomatoes on a baking sheet. Take a knife and chop them into 1/2 inch pieces. Drizzle with olive oil (approx 2-3 tablespoons), salt, pepper and died basil flakes. Bake for 30 minutes, stirring every 10 minutes or so. 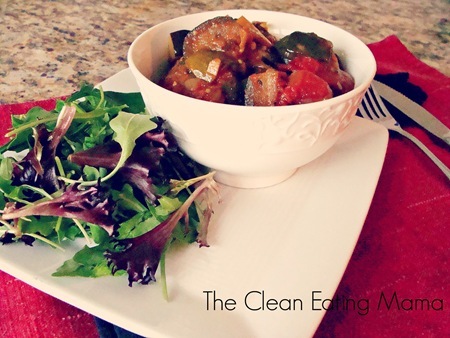 In a large bowl, toss eggplant with a good pinch of salt. In a large heavy pot, heat about 4 tablespoons of olive oil over medium heat. Add onion, a pinch of salt and pepper and let cook for about 5 minutes. Add garlic and cook until onions and garlic are soft, about 5 minutes. Add peppers and cook, stirring, until crisp-tender, about 5 minutes minutes. Season with salt and pepper and herbs. The add tomatoes, eggplant, zucchini, bay leaf and water to pot. Cook, stirring occasionally, until mixture comes to a simmer. Reduce heat to medium-low and cook partially covered until veggies are soft. Approx 20 minutes. Taste to see if you need to add any more seasonings. Serve with warm crusty bread and a salad. 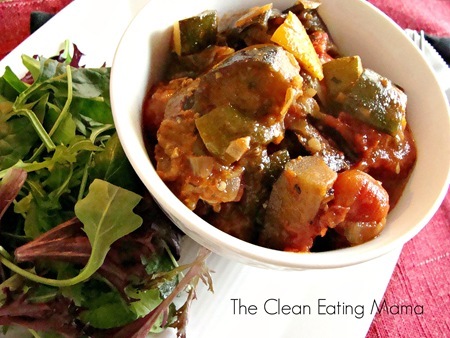 This entry was posted in dinner, eggplant, recipe, vegan, vegetarian, zucchini. Bookmark the permalink.